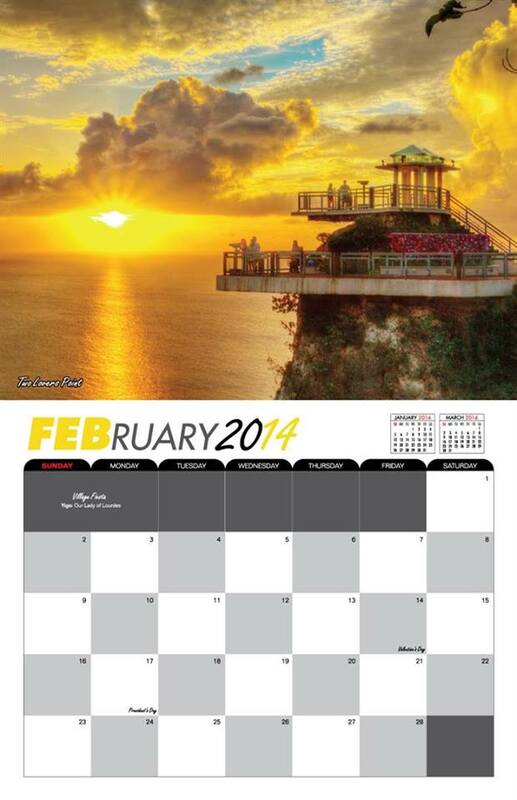 Order Your Guam 2014 Calendar Today! The 2014 Guam Tropical Images Calendar by Rueben Olivas is now available to order on Gerard Aflague Collection online. Order during our pre-order period and save $3.00. Click here to view product details and order this calendar. After the pre-order period of December 27, 2013, the calendar will be sold at the regular retail price of $12.95. We ship to the islands, to all 50 states, and to U.S. military bases worldwide. This beautiful Guam calendar, with 13 strikingly vivid and creative perspectives, frames the island of Guam creating a wonderment of tropical beauty. This is the perfect holiday gift for family and friends. The Gerard Aflague Collection in collaboration with Guam’s famed photographer, Rueben Olivas, brings the island’s imagery alive as he sees it from his perspective. Hey. I was thinking. Isn’t it just 12 days left until Christmas? Well then. It’s time to break out the guitar, and some vocal chords and join in with us as we sing the 12 Days of Chamorro Christmas (in the islands). My children and I share their talents with you all. So that you can sing along, I’ve pasted the lyrics below. Gather the young kids around the computer, press play, and start singing. Just be silly, and enjoy time together during this special time of year. Felis Nabidat to each and everyone of you. After you try your act at singing with your kids (or significant other), check out our 12-Days of Chamorro Christmas Card, Apron & Women’s Shirt all on http://GerardAflagueCollection.Com – Enjoy! 12. On the twelfth day of Christmas my nana gave to me – twelve pink ali-ling, eleven dancing pung’lao, ten chi-chi-rika, nine quick gue’li’ek, eight big ayu’yu, seven swimming ha’gaan, six sailing sak’man, five bi’na’du…four fat fanihi, three ko’ku birds, two carabao, and a gayu on a coconut tree. Christmas island-style. If you are like me, having grown up in Guam, there are a few things that remind me most of the holidays in the island. I thought I’d spend a moment to share it with you all. 1. Buenelos Dago – Those yummy deep-fried doughnuts that are dipped in sugar water. Yes. My mom (Julie) introduced me to the practice of getting the root crop, grating it in the kitchen, and preparing it to roll off my hand while squeezing it into the hot oil. So yummy and delicious. You know you got to have some. But what is one to do when you don’t have access to dagu around here neck of the woods? Krispy Kreme comes close but not close enough. Lol. 2. Lumot and Novenas – Yes. Break out those stored boxes of three king statues, baby Jesus, the donkey, the nativity, and the Christmas lights. The spider webs are wiped away, stacks of boxes are arranged to take on fresh lumot, that green carpet-like stuff that our uncles went into the jungles to harvest. It was the coolest thing, but smelled like mildew. Hmmm. Then there are the many days of prayers and singing. You know the routine….let me refresh your memory: Fanmato Manhengge, Dan Dan i Pandaretas Na Fan Palang’pang, Puenguen Yu’os, Puenguen Jesus, and on, and on. They were great cultural songs that reverberate into my soul even until this very day. I think for those of us that are in the mainland, we need to get our fix of a novena. Wishing that I could be taken back to my childhood to share my experiences with my own children. 3. Nino Jesus Taken House to House – Okay. So for those of you islanders, you remember the cue right? The alter boys coming down the street, sometimes taken on the back of the beds of pickups. Then they go knocking house to house with the Baby Jesus in hand, and a little white cloth smelling like Auntie Charo’s perfume. The doorbell rings, and one by one, we gather to pay our respects and kiss the forehead of the Baby Jesus. Oh did I forget to mention that they’d ring the tiny bell to alert the neighborhood that they were coming? Yup. Those were the days. What were your memories of home in the islands during the holidays? Share it with us in your comments below. Let us all relish in the memories that we can share with each other.